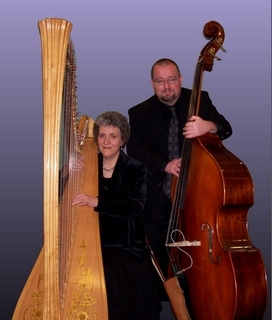 Susan’s popular harp & bass duo presents music in a variety of styles, from straight-ahead to smooth jazz. The duo has performed at numerous venues and events, including: Papa Pirozki’s Restaurant, the High Museum, the Fox Theatre, Centennial Park concert series, Woodruff Park Concert Series, Atlanta Symphony Associates Presentation, Atlanta Botanical Gardens, and Ansley Golf Club New Years Eve 2000. Susan Ottzen is an accomplished harpist whose extensive experience includes classical repertoire as well as alternative styles such as jazz and blues. She is a graduate of Case Western Reserve University/Cleveland Institute of Music where she received her Bachelor of Music. She moved to Atlanta to play with the Atlanta Symphony Orchestra under Robert Shaw and has performed with the Atlanta Symphony Orchestra, as well as orchestras in New York City, New Orleans, Boston and Nashville. Susan also freelances frequently, helping open the Marriott Marquis in downtown Atlanta and playing in their gourmet restaurant for one year. In addition to playing harp and piano (she plays piano with Out of the Box Blues Band) she is an accomplished composer with grants from the Fulton County Arts Council, and Georgia Council for the Arts, among others. Her arrangement of Stormy Weather is played on NPR’s Marketplace Radio (when the stocks are down). Originally from Montgomery, Alabama, Robert Dickson received his Bachelor of Music degree from the University of Alabama and a Master of Music from the University of New Orleans where he was a graduate teaching assistant. He performed extensively in the New Orleans area and relocated to Atlanta after hurricane Katrina in the fall of 2005. He has performed with many jazz greats including Terri Lynne Carrington, Jerry Coker, Dizzy Gillespie, Lou Marini, Jason Marsalis, Steve Masakowski, Irvin Mayfield, Davy Mooney, Ed Petersen, Shannon Powell, Lew Soloff, Johnny Vidacovich, Jacques Schwarz-Bart, and Ilona Knopfler. Dickson is currently in his fifth year as instructor of jazz bass at Georgia State University. Check out the new Jazz Harp Duo CD “Harp + Light one” here. Playlist consists of representative pieces available. More pieces are added regularly, and special requests can often be accommodated.